Many thanks to the people who expressed their support for me in this odd matter. Here is the situation as I experienced it, with cue times for the audio recording of the panel, in case people want to hear the whole exchange for themselves. "An open conversation about video art and net culture, media collectives and counter-publics"
One of the panelists, internationally renowned media art curator Kathy Rae Huffman, told me she would conclude her presentation by showing one of my augmented reality artworks, to bring the discussion up to date in current media practices. She suggested that if I attended, she would call on me and I could talk about my work as part of the "open conversation" desired for the panel. This I did, passing around my iPad2 to the audience so they could view the augments "live." (02:27:10 in the recording). KG: "Yeah, if I may "intervene" uh, first maybe we can switch the screen instead of seeing this really, uh, for me offensive AR art, he he, this is a re-intervention into the Transmediale, so - "
KRH: "Well that's a part of what activism is, you know - "
KG: "Yeah yeah! It's a re-intervention so that's pretty good, but I want to make a comment on something else ..."
The conversation went on to other topics, and the website was removed from the screen. "Contrary to the fear of the incompatible, so prevalent in the age of cloud-computing, the festival raises the question of what happens when incompatibility is brought to the fore rather than hidden away in the dark underbelly of digital culture?" So below is a screenshot of my AR installation that Gansing found so offensive: "Reign of Gold," created for the AR Occupy Wall Street project. 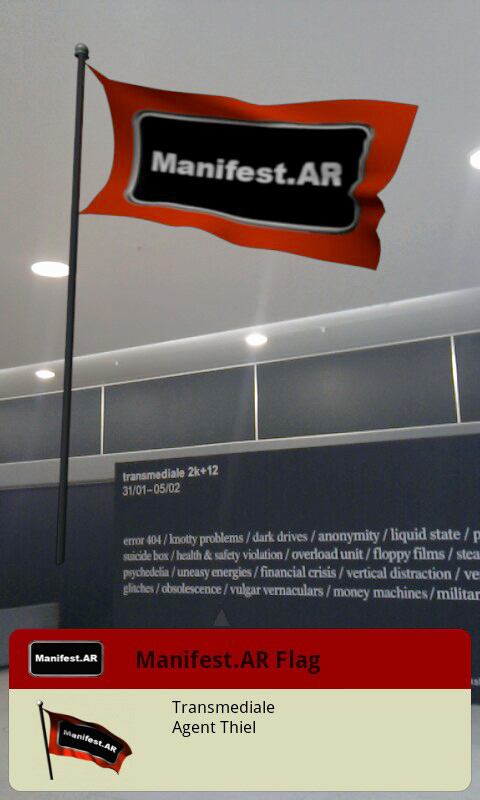 Manifest.AR cyberartist group is in/compatible with the Transmediale!